Independent digital and health marketing agency, Orchard, has launched a global digital consumer platform for one of Bayer Healthcare’s products, Elevit. Elevit is one of the foremost pregnancy multivitamins available in more than 30 countries worldwide. Orchard won the pitch to develop the global digital strategy for Elevit and was also awarded the Certified Developer Agency (CDA) to Bayer Australia. 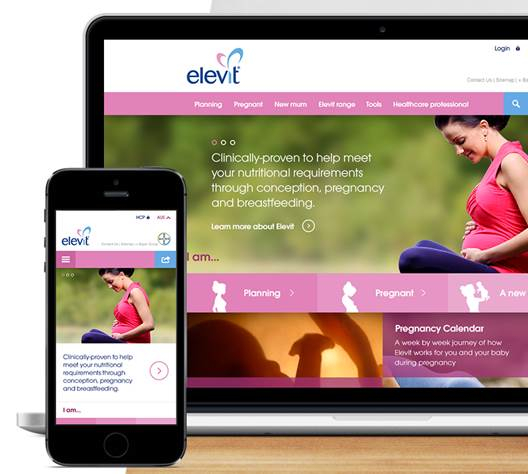 The target audience for Elevit is women, 25 to 40, who are either trying for a baby, already pregnant, or are first time mums. Orchard’s solution was a proposed global mobile-first approach to the web platform. The site helps women planning to conceive by offering a free ovulation calendar to record and monitor their cycles. Once successful she can track her pregnancy week by week through a visual and factual journey describing the baby’s development and what to expect. This visual journey showcases in-utero imagery differentiating it from many in the current market place, and can be delivered via desktop, mobile or email. All of this is supported by engaging content helping women understand their body and its changes, nutritional needs and how your lifestyle may be impacted during this time.